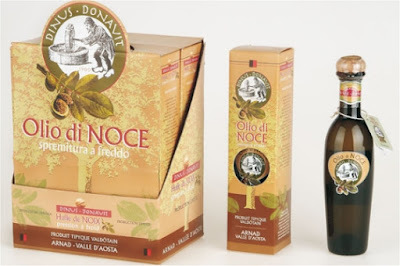 Due to the lack of trees, is tradition in the Valle d'Aosta region the homemade production of walnuts oil, now recognized as traditional Valle d'Aosta product. This special oil is produced with high quality local walnuts, using a process that, though it is based on modern equipment, it still contemplates the use of the wooden presses than once. The oil is obtained from the cold pressing of selected low acidity nuts. The shells are broken by hand using a hammer on a stone base. The kernels are ground in stone and pressed to extract oil, which is then filtered and bottled. Walnuts oil is a very delicate flavoured oil, with a little taste of walnuts, so it's excellent to use raw in salades and other dishes that do not require cooking, such as tartare or carpaccio. The taste is very sweet, but the walnuts aroma is very intense. Walnuts oil is also healing properties rich since it contains a lot of Omega 3, fatty acids beneficial for our health. It is also particularly rich in Vitamin E, which fights cell aging. The oil must be stored at room temperature, away from light and consumed as soon as possible, cause it loses its properties and freshness over time. A curiosity: it takes 3 tons of nuts to get a liter of this precious nectar.